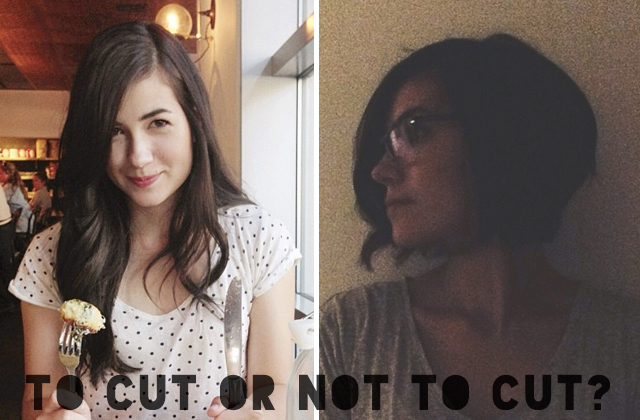 Hair and Make-up by Steph: To Cut or not to Cut? It's the dilemma I hear about most frequently from my clients. "I can't decide if I should keep growing my hair out, or cut it off. Help!!!" It is a BIG deal to cut your hair off, especially if it grows at a snail's pace. But sometimes cutting it off can be the right move, IF you are really ready. This is my friend/client Ciara. After stewing over it for months, she recently took the plunge from long to short. Even though it was a big decision, she has been loving it short and hasn't regretted it once. So how do you make sure you're someone who's REALLY ready to cut their hair off, and not someone who will leave the salon crying? 1. Don't do anything spur of the moment. Any time my clients want to go from long to short, I refuse to do it unless they are 100% sure. The last thing I want is someone regretting something I did to their hair! Give yourself time to think about it. If you go to the movies and watch Safe Haven, don't rush into the salon the next day and ask for Julianne Hough's haircut (trust me this happened). Don't do it because all of your friends are, and don't do it because you think it will be less work. Make sure that short hair is what you really want, and not just to look like Julianne Hough. 2. Think about short haircuts you've had in the past. If you have had short hair before, did you like it? Why or why not? It may look cute on someone else, but if deep down inside you don't like yourself with short hair, no matter how amazing your haircut is, you probably won't like it. However, if you have had it short and liked it, or have never had it short but have always wanted to try, then cutting it off would be a good move. You never know until you try! 3. Don't forget your hair type. There are definitely certain hair types that work better than others when it comes to short hair. If your hair is super curly, either plan on wearing it curly every day or plan on fighting it with the flat iron. If you have thick hair, make sure your stylist does enough texturizing and thinning so you don't end up with a triangle head. If you have thin hair, ask for less layering and thinning to make it look thicker. 4. How attached to your hair are you? Some girls are extremely attached to their hair, and others aren't. If you are extremely attached to your length, but need a change, consider something else before resorting to cutting it off. Change the color, learn new ways to style it, or cut some bangs. If you aren't that attached to your hair, then cutting it would be a fun and exciting change. 5. Go to someone you can trust. If I were to cut my hair short, I know exactly who I would go to. When you are ready to cut it off, it's not the right time to try a new stylist, go to a beauty school, or have your friend do it to save money. A long haircut is pretty hard to screw up, but a short haircut needs to be done by someone who knows what they are doing. Do your research and even pay a little extra money so you don't end up hating your hair.